If you think getting braces as an adult is something that’s more of an “elective” procedure, think again. At Wyndham Dental, our patients choose to straighten their smiles for a variety of reasons, some of which you may have never considered. Temporomandibular Joint Disorder (“TMJ” or “TMD”) is a painful condition that causes headaches, limited range of motion, and jaw pain. Sometimes, it’s exacerbated by a misalignment between the upper and lower teeth. If your TMJ has to make atypical movements to chew properly, it can lead to overall fatigue. Braces may help that. Crowded, crooked, and rotated teeth are usually the first ones in the mouth to develop cavities. Tooth misalignment statistically increases a person’s chance of having tooth decay. Straightening teeth could potentially help that. As with tooth decay, areas with misaligned teeth tend to be the ones where periodontal disease (gum disease) is at its worst. Flossing is more challenging, and therefor bacteria thrive under the gums. When teeth don’t fit together properly, the thousands of chewing motions start to wear on your enamel. Although enamel is strong, abnormal use will lead to your teeth wearing down prematurely. What could be better than having healthy teeth? How about a properly aligned smile! Orthodontic treatment is a holistic way to enhance the appearance of your teeth without having to alter your natural tooth structure. You may find that straightening your bite — topped off with whitening — is all you need to look your best. Do You Qualify for Clear Orthodontics? Our Wyndham dentists have been caring for smiles over 30 years. 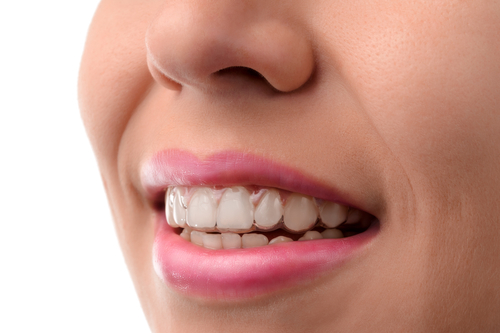 Contact us today to find out if options like Invisalign or tooth coloured braces are right for you.